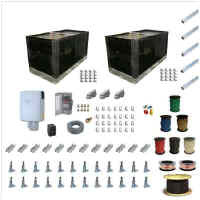 HelioPower offers 22 solar power system kits ranging from 1.4kW to 8.6kW. Click on a kit sheet below to learn more about the components, stringing, and production. Free yourself from the detail of system design and get a guaranteed reliable, proven, standard system. We carefully pair up the modules and inverters. The string sizing is not only accurate, but has a good safety factor built in to ensure proper operation in a wide range of temperatures. Our kits allow you to focus your resources on other tasks like sales. These packaged solar power systems include the 3 main components and an unequalled balance of system to provide you with the other 100+ items you'll need to install solar. We include the wire, the conduit, all the conduit fittings, sealant for the stanchions, wooden dowels for when you miss the rafter, a crayon for doing roof layout, a sharpie for marking your rails, an anchor kit for your conduit straps, the little #8 bolts/washers& kep nuts for your ground lugs, ground wire, AC disco fuses, lock rings. You get the point yet? Everything to keep you on the roof and out of the store. Buy another kit and you'd better factor in going to at least 5 other vendors, standing in line, fight for parking, waiting on a UPS shipment, paying for shipping from Michigan, etc. Comparing other companies' kits to ours isn't a fair comparison.